And Star Wars week continues on the blog! It sort of feels like Star Wars is staring to take over my life. Which is debatably a good thing. After my Rey cosplay, I got invited to go to a few other Star Wars themed events, and I wanted something a little less literal. So I found some soft, drapey rayon jersey in a nice solid brown while I was at Jo-Ann’s scoping out their Burda section at a recent sale (where I bought too many patterns). I’d been thinking about using a pattern from one of the magazines, but instead I decided to use one of the patterns I’d just bought – Burda 6667. This is quite possibly the fastest I’ve ever made a pattern – I had it traced within 15 minutes of bringing it inside, and had my fabric cut by the time I had to go to work. I finished the sewing the following day, without ever having to turn on my sewing machine. I made it entirely on my cover stitch and serger – less than an hour of sewing time. Honestly the whole thing probably took about 3 hours, if you include pre-washing the fabric. This project also made me appreciate the awesomeness of my underutilized cover stitch machine. I seriously need to get back into the garment sewing game… I’ve toyed with using it on skating costumes, but often using the zig-zag on my (totally awesome and yet-to-be-reviewd) sewing machine is more efficient, at least in terms of the time it takes to thread the machines. But, honestly, I really need to stop being so lazy because the cover stitch just looks so darned professional. My only complaint is that I seem to have issues removing the garment when I’m done stitching – I have to pull the tension discs over, tug on the thread, and then slide the project out of the way, carefully clip some of the threads, and untangle it from the machine. I constantly fear breaking a needle because of how much I have to pull on the thread. I don’t think it is the machine – the stitching continues to be lovely, but I feel like there must be a better way to do this. Any advice from my cover stitch homies out there? Please share in the comments! May have been slightly inspired by Jedi robes. Lightsaber: the ultimate fashion accessory. Pattern Description: A draped cardigan. Pattern Sizing: Burda sizes 36-44. I used a combination of size 42, but I probably should have used a size 40. I’ve traditionally used a size 40 for my Burda tops, but have noticed that the 42 has been fitting a bit better lately. Since the only thing that needs to be fitted here is the shoulders, though, I probably would have been better going with the smaller size. Were the instructions easy to follow? Super easy. There were only 5 steps, and since this is a Burda envelope pattern each one had picture diagrams. The only thing I don’t remember seeing explicitly stated was any instructions about how wide to make the hem around the outside (I used a 5/8″ hem), but it wouldn’t really matter much in the grand scheme of this pattern if you used a bit more or a bit less. Did it look like the photo/drawing when you were done with it? Yup, looked very much like the view B photo on the envelope. What did you particularly like or dislike about the pattern? Likes: Very fast to sew, very easy to construct, love the drape that comes from a simple square of fabric. Dislikes: large/I had to get a bit creative to get all the pieces cut from 3 yards of fabric. Also it is VERY loosely fitted, so I probably should have gone down a size, because it doesn’t sit quite right on my shoulders as is. Fabric used: Brown rayon jersey from Jo-Ann Fabrics. 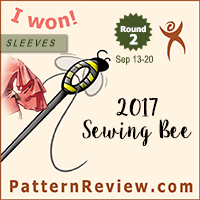 Pattern alterations or design changes you made: None, except for I widened the sleeves, because I usually need to widen the sleeves. I did not need to widen the sleeves. At all. I ended up removing all the excess I’d added to the sleeves. It still has a very relaxed fit. Would you sew it again? Would you recommend it to others? Maybe. I feel like one of these might be enough? I really like how comfortable it is, but I also have other draped cardigan pattens I still want to try, and I don’t know if I love this enough to prefer it over the idea of trying something new. However, I’m very pleased with how this pattern turned out – it created the perfect vibe for the outfit I wanted to create, and will likely see a lot of future use in my wardrobe. 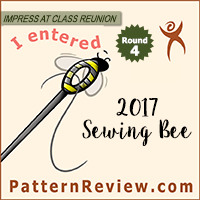 I would recommend this pattern to others – it is super easy and fast! It would be a great project for someone just learning to sew knits because you get a lot of practice hemming in straight lines, hemming around a cuff, and you only have to sew 4 seams (making the sleeves and setting them in). Conclusion: Really like the way this turned out. It is super comfortable, and a great wardrobe addition with minimal time investment. Just the sort of project I’ve been needing lately. On it’s own it looks a bit drab, but I think it will pair well with a lot of the garments in my wardrobe. Also, the quasi-Jedi vibe was totally intentional, and might be my favorite feature of this top. Great review and I love the lightsaber! It is prob. the fabric that makes it feel bigger than it is, that’s the nature of the rayon knit. You could do a fold over, like a dart, on the shoulders to make then fit better, just do in the middle of the shoulder and down both front and back. About your prob. with your cover stitch machine…what kind id it ? I have a brother and love it, I sew skating outfits all the time and use it on all of them, to finish the elastic on legs and neckline. On mine, I raise the foot, take my long tweezers and go behind the thread, under the presserfoot, pull it forward about 3 inches, Then cut it, then pull the fabric out from under the presserfoot. It will be a bit hard at first but will then come lose. Hope this helps. I love the whole StarWars thing, the brown was a nice choice for this, I have made a few padawane robes in my time! I also have the Brother cover stitch machine. I’ll try your suggestion, thanks! Haha, nice photos! Love the cardigan. You work fast!